This classic edged weapon has been sold. To view our current inventory of similar relics, click here! This Fine Weapon Has Been Sold. Presented is a pristine French Model 1833 cutlass and its original leather scabbard, both in outstanding original condition. It is signed in 19th Century script on the spine, “Manufe Rle de Chatellerault 9 (?) 1838”. On the obverse ricasso is a sharp inspection stamp of a 5 pointed star alongside another mark. The original leather washer is present. 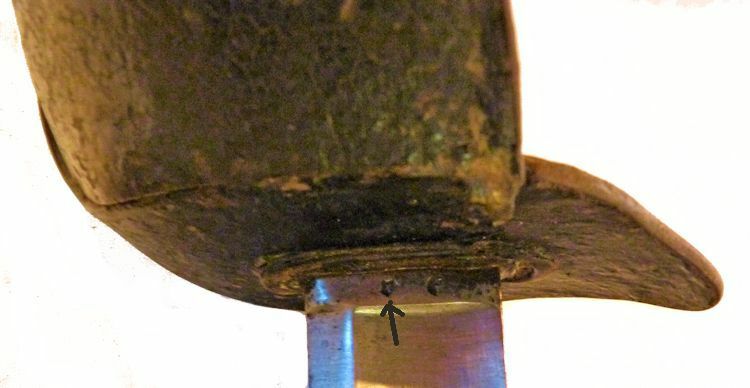 A large vertical one and one half inch anchor is faintly stamped on both sides of the blade on the right of the ricasso. This antique cutlass is so perfect it is worthy of a museum or private collection of only the finest seagoing edged weapons. As its French predecessors, it continued to set the standard for all European cutlasses, as well as the US Model 1860 cutlass, which copied its design . 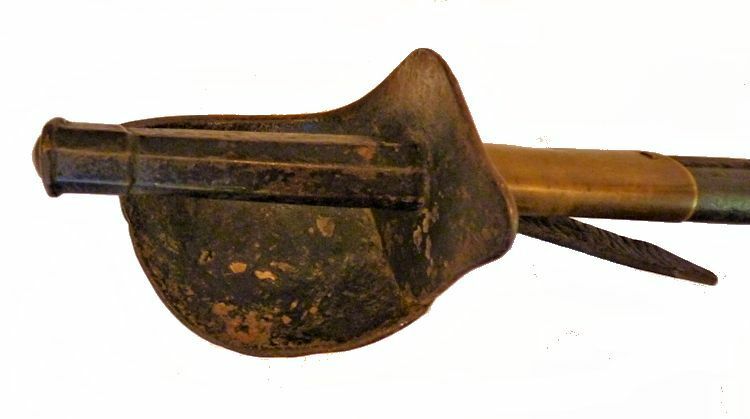 Its distinguishing features are a cast iron hilt with a pommel in the form of a Phrygian helmet, large shell guard, and wide blade. The M 1833 followed earlier French designs, and used an octagonal iron grip formed over a wood core which was protected by an iron shell guard on the obverse. The upright quillion of the M 1833 did away with the five unique lobes of the M 1801. 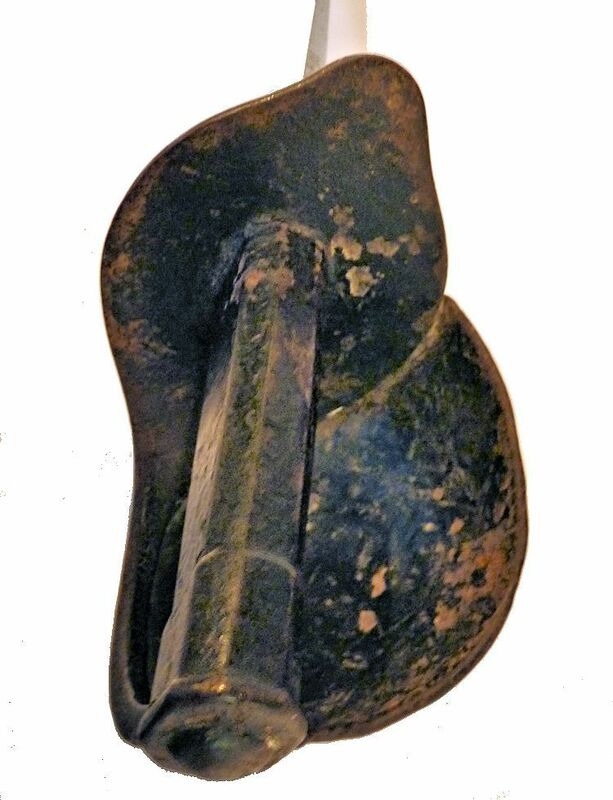 Its iron blade is 26 1/2 inches long, 3/8 inch thick, and 1 3/8 inches wide and is marked with a faint one one half inch vertical anchor on both sides. Except for the blade, all else was polychromed in heavy black enamel. MARKINGS are described throughout the listing and include a 5 pointed inspectors stamp on the ricasso alongside an illegible stamp. The spine is inscribed in 19th Century script with the foundry's name and the date, "Manufe Rle de Chatellerault 9 (?) 1838". Faintly stamped on both sides of the blade is a one and one half inch vertical anchor. There are no marks on the scabbard. CONSTRUCTION OF GUARD: The knuckle bow has a flange that accepts an elliptical guard which acts as a hand shield. The curved hand shield is brazed to the flange at the rear and then brazed on the stirrup strap. This forms a solid half shell guard. There are small dents on the guards face and some of the heavy midnight black enamel that covered all of the hilt is missing with the exposed metal darkened. SCABBARD & BLADE CONDITION: In addition to what has been described elsewhere, the blade and all individual parts are tight and correct. The blade is factory sharp without any nicks. It has a polished Silver Grey finish with some light spotting getting darker towards the point. The scabbard is in very good condition with all its stitching tight with the leather showing little wear. There is a leather tab on the back hook on the back for attaching to the throg. Max width of blade 1 3/8" Max thickness 3/8"
This is a rare and superior example of an French M 1833 cutlass and will be appreciated by those who value historic edged weapons!